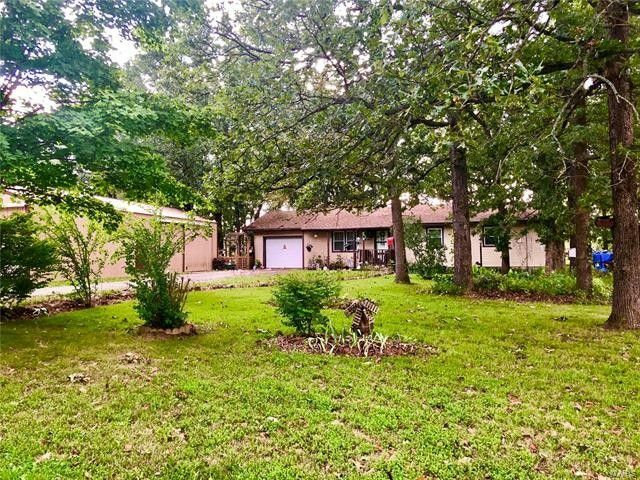 LOOKING FOR A HOME WITH A SHOP OFFERING MATURE TREES WITH PRIVACY AT AN AFFORDABLE PRICE? THIS IS IT ! !CUSTOM BUILT ONE OWNER HOME A SHORT DRIVE FROM TOWN. THIS HOME HAS 3 BEDROOMS, 1.5 BATHS, LIVING ROOM THATS OPEN TO THE KITCHEN & DINING AREA. THE KITCHEN HAS CORIAN COUNTER TOPS, A NICE SNACK BAR, PLUS A BREAKFAST TABLE AREA, ENCLOSED PATIO-SUN ROOM. THE HOME HAS A SINGLE CAR GARGAE, A NICE STORAGE SHED, PLUS A 960 SQ FT METAL SHOP WITH ELECTRIC AND CONCRETE FLOORS. A CARPORT FOR ADDITIONAL COVERED PARKING. CONCRETE STORM SHELTER, NEWER ROOF & ANDERSON WINDOWS. LARGE MATURE TREES. THS HOME HAS CENTRAL ELECTRIC HEAT & AIR PLUS OUTDOOR WOOD FURNACE.